Aarsun Woods provides to you handmade wooden dining set.This dining table could be a very trendy addition to your home. This Dining Table has sleek, simple lines and luxurious finishes. This dining set can bring elegance into your home.This sleek and classy design has a fine wooden finish and a thoughtful presence. The slight curve in the chairs are well stated with a fashionable pairing of color and style. The dining room is a gathering place for couples, families and friends. 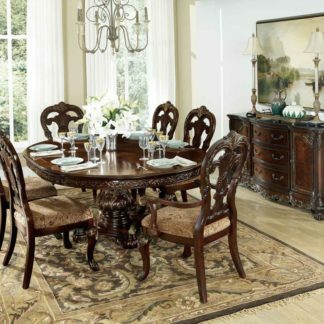 Your dining room should reflect your personality and style within the theme of the room.